Like the phosphoric acid production process, foam can also be a problem in downstream ammonium phosphate granulation processes. The addition of a suitable defoaming agent can allow for higher capacity utilization and optimal output of finished fertilizer. In ammonium phosphate fertilizer production, exhaust gases from the reaction of phosphoric acid with ammonia have to be scrubbed from the air stream to comply with emission regulations. This process involves colliding a scrubber liquor with the airstream at the proper velocity to remove entrained gases and particulates. The high-speed collision traps air inside the liquid, which in turn causes an extremely foamy solution that diminishes pumping efficiency and overall scrubbing capacity. If uncontrolled, it becomes a limiting factor in output of ammonium phosphate fertilizer and also risks environmental regulatory non-compliance. An ideal granulation defoamer should have a superior knock-down effect on the slightly different types of surface foam bubbles in the more dilute liquid phase found in the granulation scrubbing system. Design and choice of an appropriate defoamer requires an understanding of the characteristics of the phosphate rock, the particular type of granulation production processes and the intended operating parameters. Converting this knowledge into formulation and use of effective defoamers requires extensive experience and access to the operational and feedstock variables which will determine the nature of the process challenge. ArrMaz has a long history of supplying products to the phosphate industry and it remains a critical strategic focus today. That focus has led ArrMaz to develop an extensive range of defoamer products, often customized for the specific operating and raw material conditions of our customers. 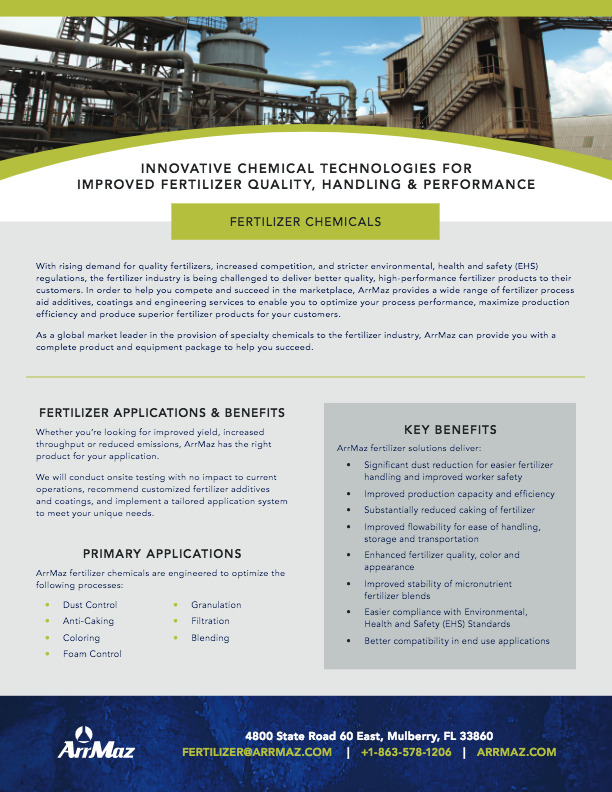 For decades, ArrMaz has been the world’s leading supplier of defoamers for phosphate fertilizer production, and we welcome the opportunity to deploy our research scientists, engineers and technical experts to help solve your specific fertilizer challenges.